Eero Saarinen was one of the most influential architects of the 20th Century. His name is associated with masterpieces in several important American cities. Eero Saarinen was born on 20th April 1910 in Kirkkonummi, Finland. He was the son of the renowned Finnish architect Eliel Saarinen and an artist mother. In 1923, he immigrated to the United States and became an American citizen, joining Yale University in 1931 to study architecture. His professional career began when he started working with furniture in the family business. After the Second World War, Saarinen contributed to the design of several buildings. 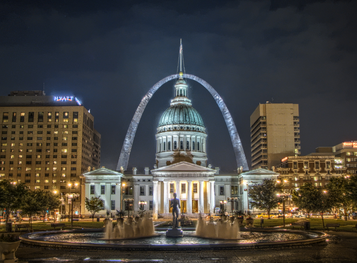 Eero Saarinen was responsible for numerous monutmental buildings, notably the Gateway Arch. In 1945, he proposed the project as part of an architecture competition to design a memorial. By 1947, a team consisting of Saarinen himself as a designer, J. Handerson Barr as associate designer, Dan Kiley as landscape architect, Lilian Swann as sculptor and Alexander Girard as painter began to create the project. The Gateway Arch is an archway in the Jefferson National Expansion Memorial in St Louis, Missouri. It symbolises American culture and civilisation. Construction began in 1963 and came to end end in 1965, the year before it was inaugurated. The public at the time was fascinated by its 630ft/192m tall curve, which cost 13 million dollars (at 1940s rates) to build. Eero Saarinen won fame and gratitude not just in the United States but internationally because of the avant-garde Gateway Arch. His international influences revolutionised architecture, but this design is a symbolic expression of American identity. Although he died in 1961 at the age of 51, Eero Saarinen left numerous great works behind him.